Officials found oil on the outside of the Ariane 5’s payload fairing after lowering the nose cone over the Star One C4 communications satellite last week. As a precaution, officials ordered the fairing to be removed from the rocket’s upper stack to inspect Star One C4, according to a manager familiar with the Ariane 5’s launch preparations. The oil came from an overhead crane used to hoist the Star One C4 satellite on top of the Ariane 5’s payload adapter. The crane then lowered the Ariane 5’s Swiss-made 5.4-meter (17.7-foot) diameter payload shroud over the Star One C4 spacecraft. Star One C4 is set to ride into orbit in the upper position of the Ariane 5 rocket’s dual-payload stack. Europe’s MSG 4 weather satellite will be cocooned inside an adapter beneath Star One C4 for launch. Technicians apparently found no significant contamination on the Star One C4 satellite. 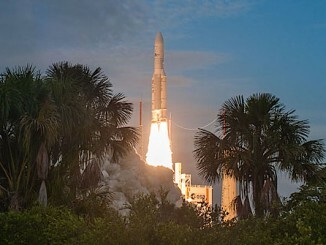 Arianespace announced Monday the Ariane 5’s launch from the French Guiana spaceport has been reset for July 15. The payload fairing will be re-installed Monday over the Star One C4 satellite, then the rocket’s upper composite — comprising Star One C4, the Sylda dual-satellite adapter and fairing — will be added to the launcher inside the Guiana Space Center’s final assembly building Tuesday. 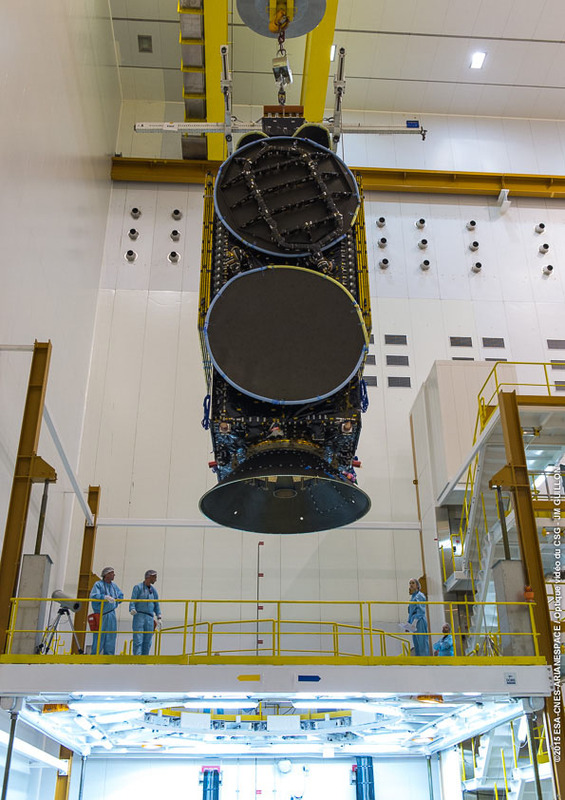 The MSG 4 satellite was mated with the Ariane 5 rocket’s upper stage June 29. The rocket is scheduled to roll out to the ELA-3 launch pad at the Guiana Space Center on July 13, according to a schedule posted on Arianespace’s website. The launch window opens at 2142 GMT (5:42 p.m. EDT; 6:42 p.m. French Guiana time) on July 15 and extends 37 minutes. 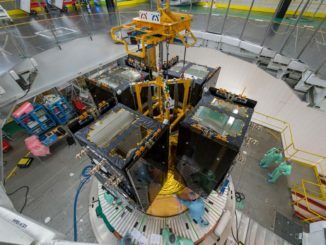 The Star One C4 satellite, made by California-based Space Systems/Loral for the Brazilian operator Embratel Star One, will broadcast direct-to-home television services across Latin America and the United States. The drum-shaped MSG 4 meteorological satellite will track storms across Europe, Africa, the Middle East and the Atlantic Ocean for Eumetsat, Europe’s weather satellite agency. The July 15 flight will mark the Ariane 5’s third launch of the year, each carrying up two large satellites at a time. It will be the sixth launch from French Guiana this year, and the 80th Ariane 5 launch since the rocket’s debut in 1996. 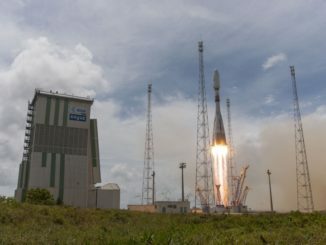 Preparations are already underway for the next Ariane 5 launch, which is set for Aug. 18 with communications payloads for Eutelsat and Intelsat.